Personal bests galore were achieved by Romsey Road Runners in Gosport Half Marathon. The fast and flat course includes a section along the seafront promenade with views of the Isle of Wight. In perfect weather conditions ten runners completed the distance: Matt Hammerton on form again was first home in 1.14, followed by Alex Prinsep making his debut at the distance and finishing in an impressive time of 1.26 and Ian Winkworth took a massive chunk off his previous time with a new PB of 1.33. The great performances kept coming with Mark Winkworth 1.38 (PB), Dave Gardner 1.43, Richard Cross 1.45, Liz Prinsep 1.46 (PB), Ben Sharman 1.47 (PB), Alice Lane 1.53 and Caroline Crump 2.37 (PB). The 25th November saw Tamatha Ryan complete the Centurion Ultra 50 Grand Slam! A series of four fifty mile races throughout the year on some very challenging routes including the North and South Downs. The last race in the series was by far the toughest both mentally & physically composed of five loops of 10 miles around a very technical and hilly wood in the Chiltern hills. With temperatures at zero and the last three hours spent running in the dark it made for a tough challenge. A very relieved Tamatha finished in 11hours 13mins earning her the prestigious Grand Slam medal for completing all four Ultra races in the series this year. Sunday 26thprovided an array of races. Cliff Reeves earned himself a personal best in the hilly Downton Half finishing in 1.55. Julie Shanker also got a PB in the AVR Wiltshire half marathon in 1.52. Mark and Sue Stileman ran the “Avebury 8 Nine” a 9ish mile trail race in Wiltshire. Mark finished just over the hour coming fourth over all and winning his age category and Sue crossed the line in 1.38. Finally, Anna Duignan and Wendy Couper ran the Meon Valley Reindeer Run 10km finishing in 1.03 and 1.19 respectively. Well done to all! Close to home, a lovely local race is the Totton Stinger, a multi terrain run through the beautiful New Forest on trails, woodland and heathland. This year three distances were offered to runners, 5 miles, 10 miles and 13.1 miles. Romsey road runners took on all three in impressive style! In the 5 mile distance Sue Stileman finished second in the V40 category in a time of 49:38 whilst Anna Duignan came in second in the V60 category in 55:08. Another win for was had for Mark Stileman in the 10 mile race, who crossed the line first overall in an amazing time of 1:08. Also running 10 miles was Penny Jennings in 1:31, Joanna McKenzie in 1:36 and Mark Adams in 1:58. The remarkable performances continued in the half marathon too, Neil Jennings was second overall in 1:26 and Sue Sleath was 1st Lady (7th Overall) in a fast time of 1:42, Jim Wright was eighth overall in a time of 1:43. The same weekend saw Elizabeth Prinsep run the Exeter’s Great Western Run in fantastic PB of 1:54 coming 12th in her age group. Last weekend, was the turn of the famous and extremely popular Great South run. This 10 mile road race held in Portsmouth passes landmarks such as HMS Victory and the Spinnaker Tower. Romsey Road Runners put in fabulous performances with all our competitors accomplishing personal bests! Times included Alex Prinsep 1:07:16, Dave Gardner 1:11:36, Ian Winkworth 1:13:11, Mark Winkworth 1:15:46, Liz Prinsep 1:24:40 and Karen Pethick 1:53:56. Meanwhile Mark and Sue Stileman travelled to Woodstock, Oxfordshire to take part in the Blenheim 10k, a mostly flat race but undulating in parts. Mark finished 7th male overall in 38:58 and wife Sue was 29th female overall in 53:42. The remarkable results continued at the Abingdon Marathon a race first held in 1982 that incorporates a number of Championship events. Places on this event fill up early as is a flat fast PB course, and it certainly was for Romsey’s Alice Lane who achieved her personal best of 4:16, followed by Brenda Topliss in 4:44. 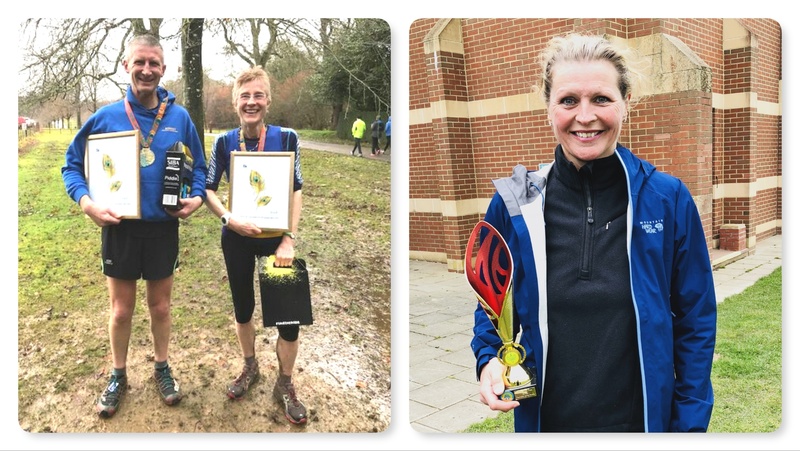 Finally, to end this impressive run of results, this weekend saw our runners compete in three races; the inaugural Breamore 10k, the challenging Beachy Head marathon and the Dorset stickler. The Breamore 10k, a completely traffic free course on bridleways and estate tracks takes in the wonderful setting of Breamore House and there’s even tea and cake at the end! Sue Stileman reported the race was hilly but managed a good time of 59:46 and Anna Duignan came 4th in her age category in 1:07. The Eastbourne Beachy Head marathon is one of the biggest off-road marathons in the UK. This challenging event, set against the stunning backdrop of the South Downs National Park, sees thousands of runners take part including Romsey’s Tamatha Ryan and Sue Sleath. The scenery is awesome and the clear sunny weather provided great visibility on this beautiful day, Tamatha said “this almost made up for the hideous ups and downs”. Sue and Tamatha both had great times for this tough race, with times of 4:04 and 4:21 respectively. The Dorset Stickler is a friendly and popular race that takes runners over 1500ft climbing across three peaks of Dorset: Okeford Hill, Hod Hill and Hambledon Hill. Our runners reported that they had great weather to experience the serious hills and the stunning views, times included Mark Stileman 1:14, Jim Wright 1:26, Abigail Cooke 1:29, Julie Shanker 1:48, Alice Lane and Jim (her dog!) 1:52 and Paul Whitaker in 1:54. Clarendon Marathon proved to be a winner for Romsey Road Runners this year! Travelled in the past by ancient Kings and Queens, the picturesque route follows mostly trails & tracks from Salisbury to Winchester but the race was made rather more challenging this year by the recent rain. However, this did not deter Romsey’s Matt Hammerton who appeared in fine form finishing 3rd overall in an impressive time of 3:02. The chasers weren’t far behind him, battling it out Neil Jennings was next to finish in 5th place in 3:13 closely followed by Mark Stileman in 3:15, 6th overall also earning him 1st place in his age group! Ian Ralph had a solid run finishing in 3:30 and 18th place overall. The ladies certainly didn’t disappoint either, Sue Sleath had a fantastic run and was pleasantly surprised to learn she was 1st lady and 29th overall, in a time of 3:45. Tamatha Ryan also had a superb run finishing in 4:16 also winning her age category. Clarendon offers several distances. Penny Jennings consistently runs the half marathon every year, this year she finished in 2:07 followed by Sue Stileman in 2:20 and Bob Gold in 2:41. Starting in the same city, the Salisbury half proved a good race for Romsey personal bests; Dave Gardner earned himself the first one finishing in a time of 1:37, Mark Winkworth was next in 1:44, another PB, closely followed by his brother Ian Winkworth in 1:45. Jo Blatherwick achieved the next PB in a time of 1:54 and not far behind was Ben Sharman in 2:00 and Alice Lane in 2:41. Anna Duignan travelled to be on home soil to complete in the Great Scottish Run in Glasgow. Despite the plentiful rain, Anna beat her time from last year coming in 2:05 and fifth in her age group. Her daughter, an ex RRR runner also had a great run in 1:32. The following weekend saw another great set of results from the Bournemouth marathon festival. On a warmer day than expected several distances were offered, on the Saturday Trevor Bond competed in the 5km finishing in 23:24 gaining a PB and finishing third in age. Ian Winkworth ran the 10km distance with his wife Katy completing in 58:33 and Elaine Bond finished in 1:14. The half marathon provided Matt Hammerton with another impressive run finishing in 1:14, 6th overall and 1st in his age group. Matt has now qualified for a championship place in the London Marathon, all the more impressive only a week after running the Clarendon marathon! Richard Cross was next to complete the half marathon distance in 1:45 and Keith Morris achieved a PB finishing in 1:51. Finally, James Battle completed his very first marathon in a highly commendable time of 3:15 with Alice Lane also taking on the distance and finishing in a great time of 4:52.